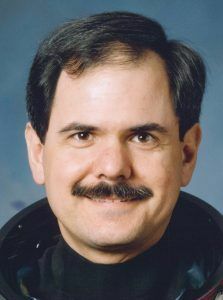 American astronomer mission specialist astronaut 1967-1993. Status: Inactive; Active 1967-1993. Born: 1936-12-14. Spaceflights: 2 . Total time in space: 19.29 days. Birth Place: New York, New York. Grew up in Shrewsbury, Massachusetts. Educated Amherst; Caltech. PERSONAL DATA: Born in New York City on December 14, 1936, but grew up in Shrewsbury, Massachusetts. Married to the former Judy Woodruff of San Marino, California. Five Children and nine grandchildren. EDUCATION: Attended primary and secondary schools in Shrewsbury, Massachusetts; received a bachelor of arts degree in Astronomy and Physics from Amherst College in 1958, and a doctorate in Astronomy from the California Institute of Technology in 1962. ORGANIZATIONS: Member of the American Astronomical Society, and the International Astronomical Union. SPECIAL HONORS: Awarded the NASA Exceptional Scientific Achievement Medal (1973), and the NASA Outstanding Leadership Medal (1974). EXPERIENCE: Prior to his selection for astronaut training, Dr. Parker was an associate professor of astronomy at the University of Wisconsin. He has logged over 3,500 hours flying time in jet aircraft, and 463 hours in space. NASA EXPERIENCE: Dr. Parker was selected as a scientist-astronaut by NASA in August 1967. He was a member of the astronaut support crews for the Apollo 15 and 17 missions and served as Program Scientist for the Skylab Program Director's Office during the three manned Skylab flights. From March 1988 to March 1989 Dr. Parker was stationed at NASA Headquarters in Washington D.C. where he served as Director of the Space Flight/Space Station Integration Office. 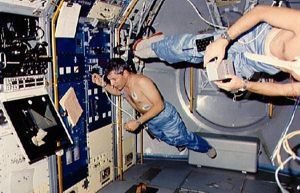 A veteran of two Spacelab missions, Dr. Parker was a mission specialist on STS-9/Spacelab-1 (Nov 28 to Dec 8, 1983) and on STS-35 (Dec 2-10, 1990) which featured the ASTRO-1 ultraviolet astronomy laboratory. Dr. Parker was the Director of the Division of Policy and Plans for the Office of Space Flight at NASA Headquarters in Washington, D.C. from January 1991 to December 1991. From January 1992 to November 1993 he was Director of the Spacelab and Operations Program. From December 1993 to August 1997 he was Manager of the Space Operations Utilization Program. In August 1997 to August 2005 he served as Director of the NASA Management Office at the Jet Propulsion Laboratory, Pasadena, California. Dr. Parker retired from NASA on August 31, 2005. BIRTHPLACE AND DATE: Born in New York City on December 14, 1936, but grew up in Shrewsbury, Massachusetts. PHYSICAL DESCRIPTION: Gray hair; blue eyes; height: 5 feet 10 inches; weight: 170 pounds. MARITAL STATUS: Married to the former Judy Woodruff of San Marino, California. CHILDREN: Mark Woodruff, December 5, 1957; Jennifer Woodruff, November 4, 1958; Jon Woodruff, February 1, 1962; Kimberly Ellen Parker, February 7, 1962; Brian David Capers Parker, March 8, 1964; and five grandchildren. NASA EXPERIENCE: Dr. Parker was selected as a scientist-astronaut by NASA in August 1967. He was a member of the astronaut support crews for the Apollo 15 and 17 missions and served as Program Scientist for the Skylab Program Director's Office during the three manned Skylab flights. From March 1988 to March 1989, Dr. Parker was stationed at NASA Headquarters in Washington D.C. where he served as Director of the Space Flight/Space Station Integration Office. 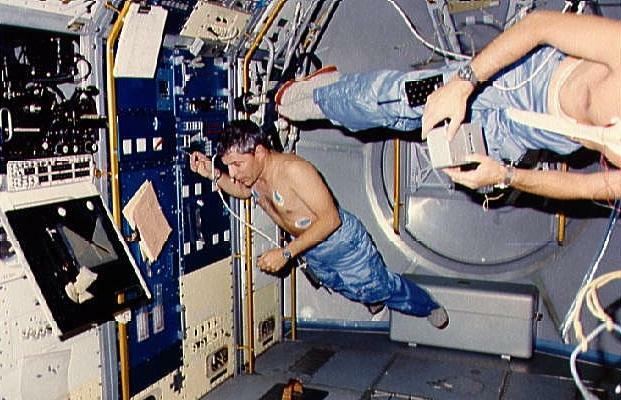 A veteran of two Spacelab missions, Dr. Parker was a mission specialist on STS-9/Spacelab-1 (Nov 28 to Dec 8, 1983) and, recently, on STS-35 (Dec 2-10, 1990) which featured the ASTRO-1 ultraviolet astronomy laboratory. Dr. Parker is currently the Director of Policy and Plans for the Office of Space Flight at NASA Headquarters in Washington D.C.
Family: Astronaut. Country: USA. Flights: Apollo 18, STS-9, STS-61-E, STS-35. Projects: STS. Bibliography: 12, 5866. 1936 December 14 - . Birth of Dr Robert Alan Ridley 'Bob' Parker - . Nation: USA. Related Persons: Parker. American astronomer mission specialist astronaut 1967-1993. 2 spaceflights, 19.3 days in space. Flew to orbit on STS-9 (1983), STS-35..
1967 August 4 - . NASA Astronaut Training Group 6 selected. - . Nation: USA. Related Persons: Allen, Chapman, England, Henize, Holmquest, Lenoir, Llewellyn, Musgrave, O Leary, Parker, Thornton, Bill. The group was selected to provide additional scientist-astronauts for Apollo lunar landing and earth-orbit space station missions.. Qualifications: Doctorate in natural sciences, medicine, or engineering. Under 35 years old, under 183 cm height, excellent health. US citizen or willing to become a naturalized citizen.. In response to the poor result of the first scientist-astronaut selection, NASA went ahead with a second round of selections. 923 people applied, of which 69 selected by the National Academy of Sciences for NASA physical and mental evaluation. By the time the new astronauts reported, ambitious Apollo Applications plans had been scrapped, leading to their nickname 'The Excess Eleven'. Seven stayed on through the 1970's and finally got to fly aboard the space shuttle. Apollo 18 (cancelled) - . Crew: Brand, Gordon, Schmitt. Support Crew: Allen, Henize, Parker. Nation: USA. Related Persons: Allen, Brand, Gordon, Henize, Parker, Schmitt. Program: Apollo. Flight: Apollo 18. Spacecraft: Apollo CSM. The most likely landing site was the crater Gassendi. Before the cancellation, astronaut-geologist Schmitt was pressing for a more ambitious landing in Tycho or the lunar farside. NASA cancelled Apollo 18 and 19 on 2 September 1970 because of congressional cuts in FY 1971 NASA appropriations. Pressure from the scientific community resulted in geologist Schmitt flying on Apollo 17, the last lunar mission, bumping Joe Engle from the lunar module pilot slot. 1983 November 28 - . 16:00 GMT - . Launch Site: Cape Canaveral. Launch Complex: Cape Canaveral LC39A. Launch Platform: MLP1. LV Family: Shuttle. Launch Vehicle: Space Shuttle. STS-9 - . Call Sign: Columbia. Crew: Garriott, Lichtenberg, Merbold, Parker, Shaw, Young. Payload: Columbia F06 / Spacelab 1 Pallet. Mass: 15,088 kg (33,263 lb). Nation: USA. Related Persons: Garriott, Lichtenberg, Merbold, Parker, Shaw, Young. Agency: NASA Houston. Program: STS. Class: Manned. Type: Manned spaceplane. Flight: STS-9. Spacecraft Bus: Shuttle. Spacecraft: Columbia. Duration: 10.32 days. Decay Date: 1983-12-08 . USAF Sat Cat: 14523 . COSPAR: 1983-116A. Apogee: 254 km (157 mi). Perigee: 241 km (149 mi). Inclination: 57.00 deg. Period: 89.50 min. Carried ESA Spacelab. Payloads: Payload: Spacelab-1 experiments, habitable Spacelab and pallet, carried 71 experiments. The six-man crew was divided into two 12-hour-day red and blue teams to operate experiments. First high-inclination orbit of 57 degrees. 1983 December 8 - . Landing of STS-9 - . Return Crew: Garriott, Lichtenberg, Merbold, Parker, Shaw, Young. Nation: USA. Related Persons: Garriott, Lichtenberg, Merbold, Parker, Shaw, Young. Program: Spacelab. Flight: STS-9. STS-9 landed at 23:47 GMT. .